Following a liver transplant at the end of 2011, things are getting back to normal. I have returned to action in all three of my sports. OK, so I was last in my first croquet tournament, not far off last in the minigolf, and a distant last in a 100m jog at the local Veterans' league, but it has been great fun any way and my form has been improving a bit since then. 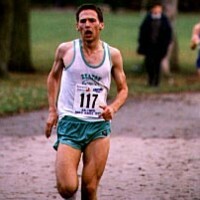 Running, which was my main sport from the age of 14 until a few years ago. This section contains some of my PBs from years ago, and photos from a couple of overseas trips competing in Masters events. Also, in September 2003 I competed in the Great Gorilla Run in London. I've been playing croquet since 1997, and have played in three Golf Croquet World Championships, including in Cairo and West Palm Beach. The croquet success introduced me to the idea that finding a sport for which you have an aptitude may be a better route to success than finding a sport you enjoy and trying to become good at it. 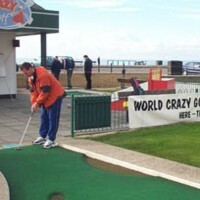 Attempts at curling and disc golf, among others, were short lived, but I took up minigolf in October 2004 after competing in the World Crazy Golf Championship in Hastings. 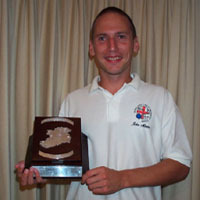 In 2006 I won the British Minigolf Championship in Taunton. When it comes to watching sport, I used to be a big speedway fan. In 1990 I did an 1100-mile walk visiting British speedway tracks, and raising £35 for charity, which wasn't much money in those days either. Away from sport, I like easy listening music and in May 2003 I went to Linz, Austria to see a Roger Whittaker concert. This is just one of the items featured in a section of general hobbies and passing interests I may see fit to include from time to time. While ill I took to spectating at sports such as women's football, cycle speedway, lacrosse and roller derby. have compiled a list of relevant links.